There is only a few days left until Mother's Day and our phone lines are flooded with calls from frantic husbands asking for advise on what to buy for the New Mom, Mother and Mother-in-Law. Selecting the perfect gift can be quite tricky. One has to consider many different elements; budget, tastes and preferences. The most popular choices are always chocolate, spa products and fine jewelry. 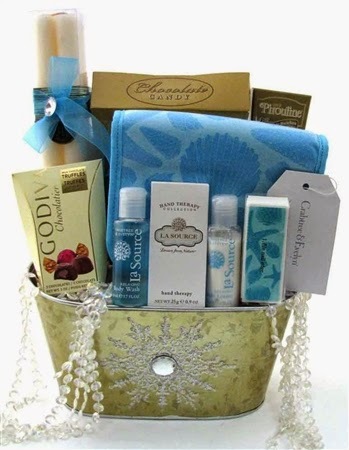 Quality is crucial when sending out a basket to a loved one that is precisely why at Glitter Gift Baskets we use only the finest spa products by Crabtree & Evelyn and Upper Canada Soap. Our Chocolates and cookies are also phenomenal!! (Unfortunately for our waistlines) We use the finest imported French and Belgian Chocolate and popular brand names like Godiva, Chocolatier Dolfin, and Maxim de Paris. A Special Mother-in-Law basket is quite original. 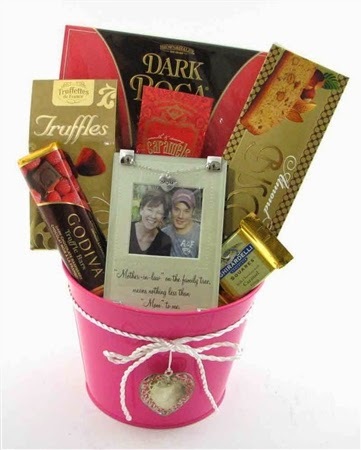 We were very pleased when first saw this basket in our Mother's Day Collection. A unique picture frame with a special inscription "Mother-in-law on the family tree means nothing less than Mom to me." If this doesn't impress her and make her heart melt then nothing will!! The La Source Spa Getaway is also another top pick for this season. The La Source scent by Crabtree & Evelyn is absolutely the best and so fresh for the summer! This gift basket contains everything you need to get in a warm bath and relax and pamper yourself over candle light while eating your delicious Godiva Chocolates. The Swarovski Crystal Heart Mother's Day Special is a great little gift for your special Mom. It is on sale for $59.00 with FREE delivery. Its a great deal and much better than a bouquet of flowers because she will have the Swarovski Crystal Heart for a lifetime and she will cherish it.